People have asked me on my book tour what is the strangest Chinese-American food I’ve encountered. While Szechuan alligator is up there (Cajun Chinese food! 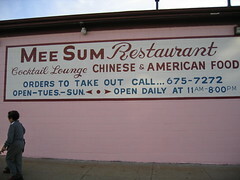 ), I have to say that I would have to say it’s the chow mein sandwich, which is a speciality in southeastern New England. Here is a thoughtful article from Flavor and Fortune by Imogene Lim, a third-generation Canadian Chinese scholar who speaks (no joke) better Swahili than Chinese. It’s essentially a starch-on-starch sandwich and people there love it. It’s served on the school the cafeteria menu. They even shipped it overseas to hometown boys during the first Gulf War. 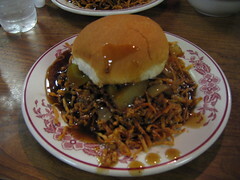 Basically this version is a hamburger bun was a crunchy pile of thin Chinese noodles slathered in a pool of brown gravy with bits of celery and onion thrown in. It’s moist, and soft and crunchy, all at the same time. It is actually quite daunting and I wasnâ€™t sure how to eat it. The gravy had softened the bread, making it too messy to pick up with my hands. I tried to attack itit with a knife and fork. The gravy gave the sandwich a lot of flavor, and the textural mix of crunchy noodles, soddened bread, and flavored liquid was quite intriguing. It wasnâ€™t bad. In some other life, I think we would have even thought it was quite good, but we trying to get our minds around the concept of a starch-on-starch sandwich — a staple Chinese food presented in a staple American format. So the Oriental Chow Mein Company, which is arguably the largest supplier for chow mein mixes in the world. The company opened in the 1920s, and had been passed down through the family, and was largely now managed by Barbara Wong and her sons. Barbara was born in Canton, China when it was known as Canton and now Guangdong. I visited the factory, which you can find through the crunchy goodness smell. The dough was flattened by continuous rolling into a thin sheet, cut up into strips, steamed and then fried. As they come out in stiff strips the other end, they looked the end products of a corporate paper shredder. There were piles of discarded noodles scattered on the floor. A methodic â€œswish-chunkâ€ sound streamed through the entryway: boxes being sealed. There were stacks and stacks of boxes waiting to be mailed, addressed to Tulsa, Oklahoma; Locus Grove, Georgia; Lake Oswego, Oregon; Dunnellon, Florida. â€œEverywhere, everywhere, everywhere. My customers are from all 50 states,â€ Barbara explained. Those customers all originally grew up in the area, but then left. It was interesting, because for many of them, the chow mein sandwich captured memories of growing up: Momâ€™s home cooking. Hanging out with after school. Flirting. Their first dates. The sandwich evoked both family and friends.